Corsair Vengeance LED Series DDR4 memory modules are designed to provide a unique look with vibrant LEDs and a precision engineered light bar. This Vengeance PC RAM and it’s unique style comes as 2 memory modules, each containing 8GB of DDR4 memory. This memory density is a comfortable RAM count for the average PC user; games, film and various other media will run without memory issues. The frequency is a common DDR4 sweet-spot, thought to be a great balance of both the frequency and CAS Latency. The power required is as low as is currently possible at this stage in memory technology. Vengeance LED DDR4 form factor is optimized and compatibility-tested for the latest Intel X99 and 100 series motherboards, forging reliably fast performance. With any standard DDR4 DIMM memory socketed motherboard you shouldn’t have any trouble installing the impressive Vengeance LED DDR4 series. DDR4 Vengeance LED RAM features unique colour options and a custom LED light embedded into the top of the DDR4 memory. The LED will display in either Red, Blue or white depending on which RAM is purchased, the chosen colours have been specifically selected to complement the style of your system through pairing with the latest high-end motherboards and PC components. 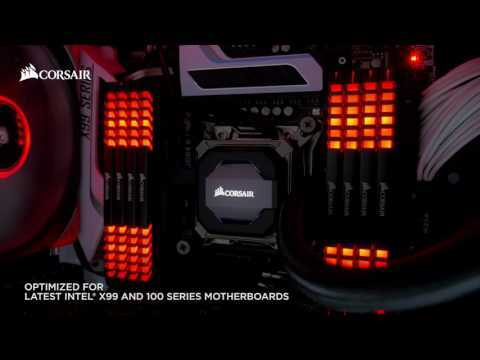 Corsair have heavily designed the Vengeance LED DDR4 around high-performance overclocking. Each module from the Veng eance LED RAM series is built with highly-screened memory ICs and an eight-layer PCB, with further overclocking improvments through the efficient heat spreader that provides effective cooling. The DDR4 memory sticks boast an eight layer PCB system. If your computer is trying to squeeze too much information into one layer then you are going to experience a significant rise in temperature. That rise in temperature will evetually cause overheating, resistances changes and things will stop working correctly. Utlizing eight layers helps eliminate this. Each computer memory module is equipped with numerous ICs or Integrated Circuits. Each IC in the Corsair Vengeance LED series is rigorously tested to check for defects in the technology. This is done by applying particular ‘patterns’ to them to see if the outcome has any faulty circuit behavior and if so determine the cause of failure. Using the best IC’s leads to highly overclockable memory. The heat spreader on Corsair vengeance LED DDR4 memory is made of Anodized Aluminum, creating a faster heat dissipation and a much cooler operation. Usually the overclocking overhead is limited by operating temperature, but not for the Vengeance LED. Due to the unique design of the heat spreader, the temperature is continuously lowered as heat is pulled away from the ICs and into your system’s cooling path! XMP 2.0 is supported by both vengeance LED DRAM and Intel’s X99 and 100 series motherboards. Simply select XMP mode in the BIOS and it will automatically adjust to the fastest safe speed for the Corsair DDR4 Vengeance LED. You’ll get amazing, reliable performance without lockups or other strange behavior. Enjoy trouble-free, automatic overclocking with the support of XMP 2.0.